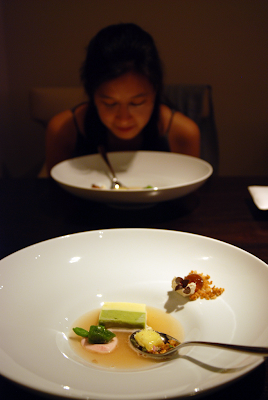 A few years ago -- back before we turned into big Paleo nerds -- M and I celebrated an anniversary at Alinea, a damned fine restaurant. The food was awesome in a look-ma-no-hands! molecular gastronomy kind of way, featuring unexpected twists, textures, and flavor combinations with every bite. But just a week or so after our meal, Alinea's young chef/owner, Grant Achatz, learned that he had been stricken with cancer. And not just cancer, but cancer of the tongue. The doctors recommended that he undergo surgery to remove most of his tongue and part of his mandible, which would've rendered the then-33-year-old chef of arguably the best restaurant in North America unable to taste food ever again -- and even then, he only had a 50 percent shot to live past the grand old age of 35. It was almost Shakespearean. Ultimately, Achatz chose an experimental treatment that preserved his tongue, but required radiation that burned and peeled off his taste buds. It wasn't clear if he'd ever taste anything again. Today, Achatz was interviewed by Terry Gross on Fresh Air (to promote his book, cookbook, and new restaurant). His story is engrossing, harrowing, and uplifting, and foodies of all stripes should definitely give it a listen. Paleo or not, we should all share this guy's intense appreciation for flavors and food.